Colombian Empanadas | That Yum Factor! There are several Noches locations and they are all equally delicious. This is their Colombian Empanada. 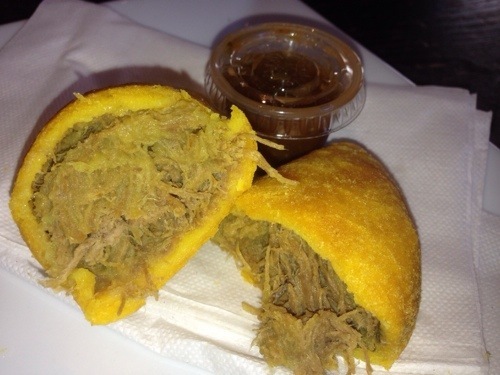 I am a fan of all kinds of empanadas, but this one has a crunchy dough on the outside with beef AND potatoes in the center. The beef and potatoes mixture is perfectly blended, allowing the flavors to melt in your mouth. If you order this, make sure to dip it in the spicy aji sauce that it gets served with. I’m sure I’ll have more posts of the food from this restaurant soon, because it is my favorite Colombian spot in NJ. Posted in Hudson County - NJ, Image format and tagged North Bergen on April 10, 2014 by thatyumfactor.